Cooper Pest Solutions Technician Terry Rice and Jorge Deleon of Preventive Pest Houston inspect for bed bugs during the training event. From Arizona to Pennsylvania, pest management professionals (PMPs) from all over the country made the journey to Lawrenceville, N.J., to attend BedBug University’s Boot Camp Feb. 16-19, 2016. Only held three times a year, the event is an intensive four-day, hands-on training session that covers all aspects of bed bugs, including biology, history, treatment and monitoring, focusing on BedBug Central’s exclusive “NO PREP” approach. Additionally, the class covers all the business, legal and administrative challenges that are unique to bed bug treatment. Masters Pest Control, Port Jervis, N.Y., sent Tyler Fetherman and Mike Smith to experience the boot camp. Also in attendance was Carl Boykins of Rest Easy Pest Control in Glen Cove, N.Y. He already has several years of experience with bed bugs, but was looking to expand his education and training on steam treatment protocols. 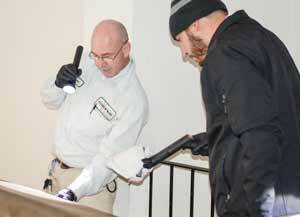 On the first day, attendees went through classroom training with BedBug Central Technical Director Jeff White. The following day, participants were split into small groups and received hands-on training at a local hotel. Cooper Pest Solutions’ trained technicians demonstrated how to execute initial bed bug procedures and follow-up treatments. Following the hotel training, attendees were transported to actual bed bug infestations, where they performed the initial and follow-up treatments with supervision from technicians. On the third day, Phil Cooper, CEO of BedBug Central, provided attendees with information on all the business, legal and administrative challenges associated with bed bug treatment programs. Dr. Amanda Eiden, a postdoctoral research associate at Rutgers University, says the boot camp has expanded her perspective on how her research can better suit pest management businesses. Pesky Critters’ Goins notes that all of his training and education he received from the boot camp will be brought back to his company, where he plans to restructure his current bed bug protocols. Additional benefits of BedBug University’s boot camp is the expedited approval process in becoming a bedbugFREE member. Upon completion of boot camp, Pesky Critters, Masters Pest Control and Thur-O Pest Management of Exton, Pa., all received their bedbugFREE membership. Rest Easy and Preventive Pest Control of Houston also participated in the boot camp, but had received their bedbugFREE membership at a prior boot camp attendance. BedBug University’s next boot camp will take place Aug. 9-12, 2016, at BedBug Central’s headquarters in Lawrenceville. Applicants interested in attending can register on BedBug Central’s website.